The puns keep coming thick and fast from the team at Two Birds – as do the IPAs – with this one continuing in the same theme as the brewery's recent NEIPA. 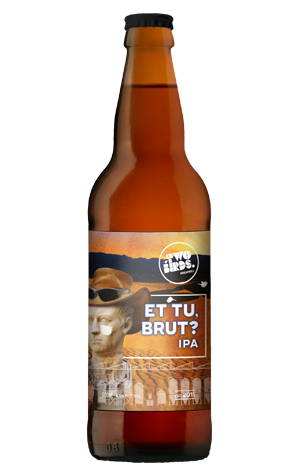 Here, we go from Jucius Caesar to Et Tu, Brut? and from hazy IPA to their take on the Brut variant. Without travelling to the West Coast of the US to try the beers that launched the style, we can't be certain exactly how such beers are supposed to present, but this one seems to tick the boxes from its descriptors. It's very pale and clear, its highly aromatic and it finishes very dry. What's more, the hop character is of the sort that offers more than a nod to white wine, albeit with a light malty sweetness and added intensity on the palate from the bitterness. If this is how Brut IPAs are supposed to be, we'll happily take one in the back for the team.